In his first public speech since June 2012, President Bashar Assad laid out a peace plan that included a national reconciliation conference, elections and a new constitution for his war-torn country, but said he would not deal with “terrorists”. His speech was almost immediately panned by the Syrian opposition who said Assad had offered no new concessions, and repeated their calls for him to step down. “We do not reject political dialogue, but with whom should we hold a dialogue? With extremists who don’t believe in any language but killing and terrorism?” Assad said. “The political solution begins with regional and international powers halting their support for armed groups, which will be followed by a halt by our security forces to crack down against them,” the Syrian President said amidst enthusiastic applause from supporters. “We are fighting an external aggression that is more dangerous than any others, because they use us to kill each other,” he added. “Those are the enemies of the people and the enemies of God. And the enemies of God will go to hell,” Assad said. Assad made no mention of international appeals for him to step down and criticized Syrian dissidents and rebels as Al-Qaeda affiliates manipulated by the West. George Sabra, vice president of the opposition Syrian National Coalition, refuted Assad’s accusations and told Reuters the Syrian regime’s plan did “not even deserve to be called an initiative”. “We should see it rather as a declaration that he will continue his war against the Syrian people,” he said. “The appropriate response is to continue to resist this unacceptable regime and for the Free Syrian Army to continue its work in liberating Syria until every inch of land is free,” Sabra told Reuters. Brahimi had earlier warned that a continued civil war in Syria would lead to a failed state in the heart of the Middle East. “Syria will turn into hell” unless both sides come to the negotiating table, Brahimi said. He warned that by the end of 2013 the death toll could rise to 100,000. On January 4, the UN predicted that the death toll had already reached 60,000. 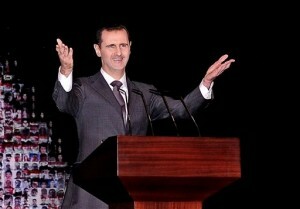 An editorial in the UAE’s Khaleej Times accused Assad of contempt for labelling political opponents as Western puppets. William Hague, the UK Foreign Secretary, described Assad’s speech as “beyond hypocritical” while the EU reiterated its demand that the Syrian President step down. Assad admitted that Syria appeared isolated, but thanked Russia, China and Iran for supporting Syrian sovereignty and not “interfering in Syrian affairs”. “We understand what is going on there and that the family has held power for 40 years; undoubtedly, there is a call for change,” he told a press conference on December 20, 2012. Putin’s comments came a week after the Russian government denied that it had altered its Syria policy. The media had speculated that Moscow was about to leave Assad to his fate after deputy foreign minister Mikhail Bogdanov indicated that the Syrian opposition could win the conflict. However, according to the UK-based Sunday Times on January 6, five Russian ships carrying hundreds of marines and military vehicles were approaching the Syrian port of Tartus. The newspaper quoted a Russian diplomat as saying the naval deployment was aimed at deterring “Western intervention” in Syria’s civil war, including the landing of special forces on the ground. The Sunday Times said this was the largest Russian force in the area in 40 years.